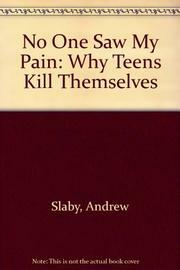  Despite his book's misleading title, Slaby's experiences in counseling grieving parents raise important questions about why so many youths' cries for help go unanswered. More than 2,000 American teenagers kill themselves every year, and one in ten experiences some form of severe depression during the high school years. Slaby, a psychiatrist specializing in depression and crisis intervention, profiles seven families responding to the loss of a teenager and one case of failed suicide. Only in the last case do we have access to the child's feelings, and that discussion adds little to our general understanding because the child, from a born-again Christian family, could only insist that God had intervened to save his life when he tried to hang himself. So although Slaby purports to tell us ``why teens kill themselves,'' interviewing their parents and siblings tells us more about how families cope with their own pain. These physical and emotional reactions to loss range from isolation and denial to anger and blame. Some families become stronger in coping with their grief, others fall apart from the stress of self- accusation. Finally, in the section ``Working with Suicidal Youth,'' Slaby focuses on some of the reasons why our health care system, families, communities, and churches are sadly inadequate in responding to teenage depression. ``Almost half the teens who kill themselves,'' he writes, ``do so within three to six months of visiting their doctor for some vague medical reason.'' Few cries for help are followed up by doctors, teachers, suicide hotlines, or even the police. But it's not just the ``safety net'' that's failing. Slaby suggests that today's generation faces stresses- -divorce, drugs, violence, and economic instability--that bypassed previous generations, and these factors require a whole new set of coping strategies. ``Surviving Suicide'' would be a more apt, if less sensational, title for this casebook of eight families.